With our MORPHEUS ​digital filter module, we’re finally able to unleash the full power of the 14-pole Z­-Plane Filters that Dave invented for the E-mu Morpheus synthesizer. 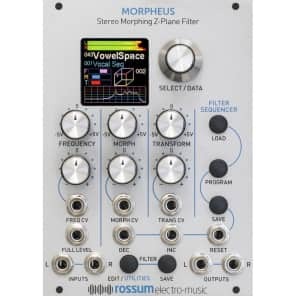 The MORPHEUS Eurorack module includes over 190 filter configurations. Each configuration is composed of up to 8 complex filters that you can picture as being at the corners of a three dimensional cube. Morpheus gives you the ability to smoothly interpolate between those 8 filters within the cube’s three dimensional space.